This video, posted by Ben Greer, is EXTREMELY DRAMATIC. 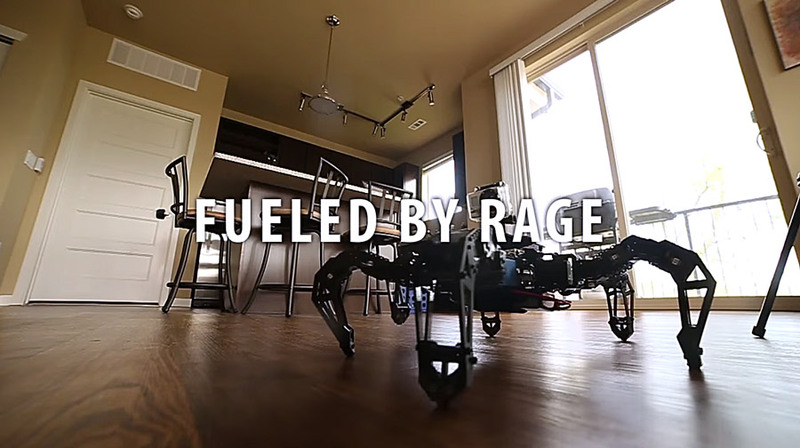 Featuring a PhantomX AX Hexapod with a GoPro mounted to it (not to mention a sweet software stack), the video really captures some of the awesomeness of owning a Hexapod. This video was apparently made in Ben’s free time, which is really amazing, considering the high production value. Give it a watch! 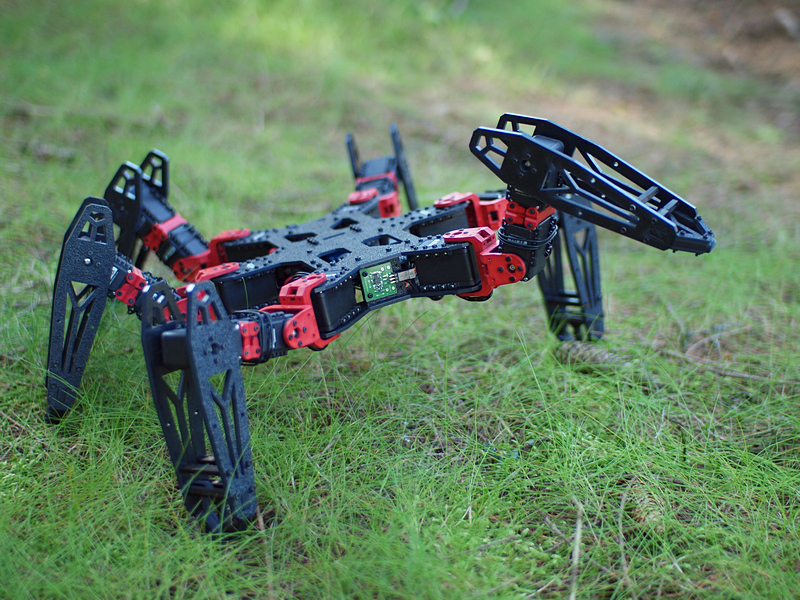 When we take one of our PhantomX Hexapods out for a walk, we almost always get the question ‘Can it go up stairs?’. Our normal response is ‘Nope!’. But it looks like Youtube user AndrewHumphries is working on that problem! 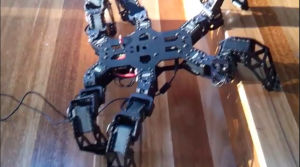 Check out this video of the Hexapod climbing stairs. The hexapod doesn’t move very quickly and needs a helping hand at the end, but it’s always fun to see what tasks our robots are up to. 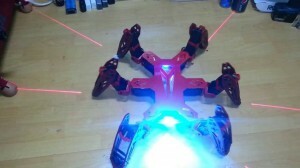 User Plasma We’s has some fun mod’s to the PhantomX Hexapod – each leg gets a laser and the main chassis gets two super bright RGB LEDs. Just add music and this crawler is a one-bot dance party! Plasma We’s youtube Channel for more laser hexapod goodness. IEEE Spectrum has a great article on researchers with ISIR, Universite Pierre et Marie Curie-Paris running experiments with out PhantomX Hexapod. 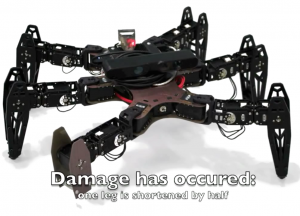 In these experiments the researchers are examining algorithms for robots to ‘recover’ from damage. 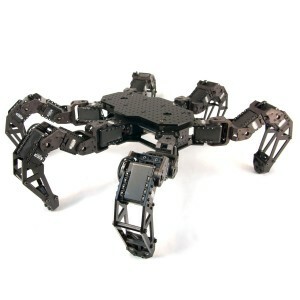 In this case, they shortned a leg of the hexapod, and use a T-Resilience Algorithm to calculate a new walking pattern/gait. Their initial gait was able to acheive a top speed of 26cm/s. When they shortened one leg to half it’s original length, the performance dropped to 8cm/s. At this point the robot begins to calculate a new gait. It runs 40 simulations, then trys the best of these simulations in real life. The hexapod will run this experiment 25 times to determine the best new gait. In only 20 minutes the hexapod is able to use a new gait that gets 18cm/s – three times the performance of the original gait under damaged conditions! 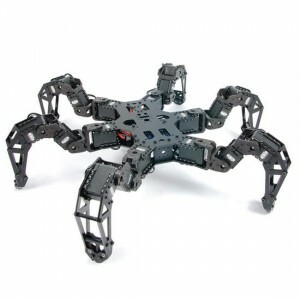 Now this is no normal PhantomX Hexapod. This model has a custom chassis, an IR camera, MX-28s, an on on-board computer, and a custom built ‘damaged’ leg. Researchers Sylvain Koos, Antoine Cully and Jean-Baptiste Mouret have done a great job with this experiement as well as documenting it. More information about the paper can be found here and here. A PDF of the paper can be found here. Well Zenta and Kurt Eckhardt are at it again, this time porting the Lynxmotion Phoenix code to our very own PhantomX Hexapod! Running the Phoenix code, our Hexapod’s movements are smooth as silk while it scuttles across the floor in an incredible life-like fashion. Just check out these videos to see it in action. 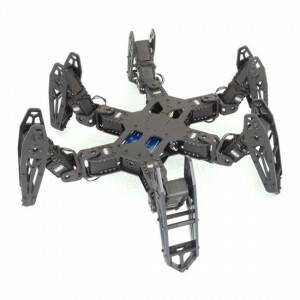 The code for putting the Phoenix code on your Hexapod is available here. Keep in mind that this is a work in progress and may require some hardware modification of your Hexapod, so proceed at your own risk. 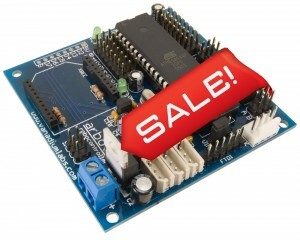 Summer Sale on ArbotiX RoboControllers, Commanders, and Kits! The ArboriX Robocontroller is THE best way to interface with Dynamixel Servos. It’s used in everything from robotic turrets to crawlers. Today, we’re slashing the price of this beloved micro-controller from $99.99 to $59.95! This also meams that the price on the ArbotiX Robocontroller Starter Kit will drop from $189 to $149.95! We’re also lowering the price of the ArboiX Commander – an Arduino Compatible gamepad style controller. We’re dropping the price (previously $89.99) down to $59.95. The Commander communicates with the Robocontroller seamlessly via an XBee connection. But don’t think that the commander only works with the robocontroller – it in fact can control any XBee compatible system. The Commander has a wide variety of functions, and it’s designed to be customized so that you have perfect control over your project. The great new prices on the Commmander and Robocontroller also mean that we’re lowering the prices some of our most popular kits. The PhantomX AX-12A Robot Turret will be dropping from $249.95 to $199.95, and the AX-18F version will go from $349.95 to $309.95. 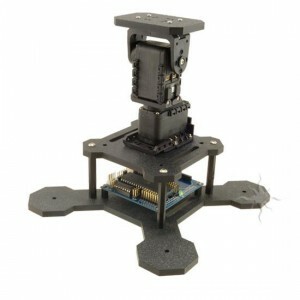 The basic PhantomX Hexapod Kit without Servos and the comprehensive PhantomX AX-12A Hexapod and PhantomX AX-18F Hexapod kit sare all dropping $100 to $549.95, $1,199.95, and $2,149.95 respectively. We hope that these new low prices will get your robotic projects up and running even faster than before!